Objavljeno 14.03.2019. 15.04.2019. Autor Andrea Guša Komentari Nema. Želiš komentirati? After finishing last in their semi-final at Eurovision 2018 with the song Our Choice, this year Icelanders are sending an act which certainly will not go unnoticed. It is a band called Hatari, whose members are Klemens Nikulsson Hannigan, Matthías Tryggvi Haraldsson and Einar Hrafn Stefánsson. With their peculiar image and controversial statements Hatari are causing a multitude of split reactions. While some hate their provocative performances and songs, others simply love them. 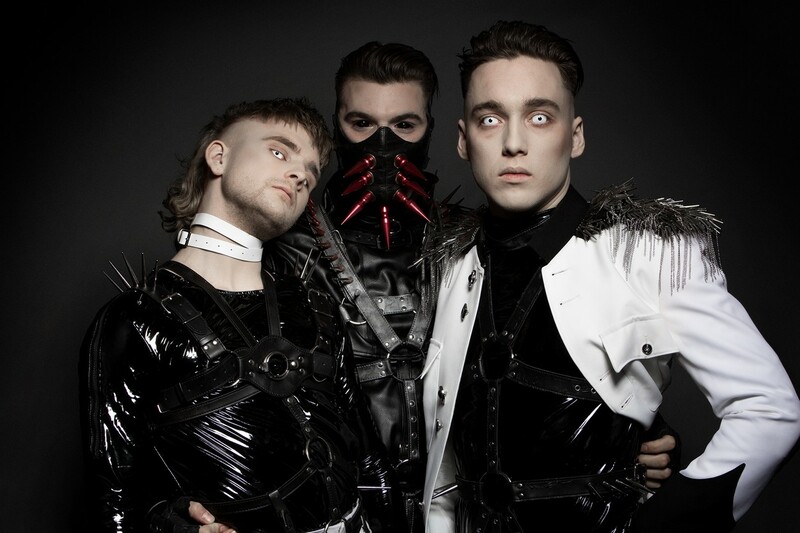 Hatari will represent Iceland at this year’s Eurovision in Tel Aviv with a song called Hatrið mun sigra, which in translation means “hate will prevail.” The popularity of this trio is undoubtedly growing. Although half of the public and the Eurovision audience see them as somewhat too extravagant, bookmakers and other fans give them a great chance of winning the Eurovision Song Contest. Can Hatari really bring the biggest European music contest to Iceland for the first time, or will the Icelanders still have to wait some years for that to happen? In their interviews and media appearances, the Hatari often give very mysterious and intriguing answers to journalist’s questions. What did they reveal in interview with Eurosong.hr, find out down below. Your song, appearance, and performance triggered a split reaction between various Eurovision fans and critics. What do you think of it? Is that a good sign? While Hatari welcomes all criticism, we would like to point out that, ultimately, it is futile to resist the doom that is upon us. Did you expect to win at Söngvakeppnin? Why did you sign up for that competition? What was your main reason? Our overwhelming victory in the Icelandic preliminaries and subsequent rising popularity across Europe tells us that the people agree with our agenda of upholding a critical discussion about the competition’s context. Eurovision is a political affair. Winning the Eurovision Song Contest would bring us one step closer towards our goal of dismantling capitalism. Hatrið mun sigra in translation means „Hate will prevail“. Is there a hidden meaning behind the song’s lyrics? Is there anything you want to share with the listeners through the verses? Hatrið mun sigra is, in our view, a dystopia, a reflection on power and the powerless, hope and hopelessness. It is a dark vision of the future, a warning against what we see as a possible reality if we do not love one another. I’m assuming that you work really hard for your eurovision performance. Will the staging be similar to the one from icelandic National Final or can we expect some changes? Yes, we are working very hard. We cannot reveal details, but can confirm that everything is going according to plan. Many think that the jury will not give you enough points when the time comes. What do you think about that? Many people are wrong about many things. Only time will tell. Did you listen to the songs of your competitors? Any favourites already? The Eurovision Song Contest this year holds a large group of talented people. Hatari doesn’t believe in favoritism. The end is near. What do you think is more important – the song or the performance? Form follows function, the medium is the message. A Eurovision performance entails a composition such as ours, of course, but that is only one aspect of the medium, albeit an important one. As a band, you are only four years old and you have already achieved tremendous success. What can we expect from you in the future? The Hatari brand will continue to gain added value, so to anyone thinking of making an investment, why not purchase some limited edition branded Hatari merchandise? And for the end, If you win Eurovision, what will that mean for you and for the Eurovision world? Songs may come and go but Eurovision is forever. The Editorial Board of Eurosong.hr would like to thank Hatari for their time, and wishes them all the best!